If you’re leaking antifreeze but not overheating or you have a car leaking antifreeze when parked, you still have a chance to repair your vehicle for a lower cost. 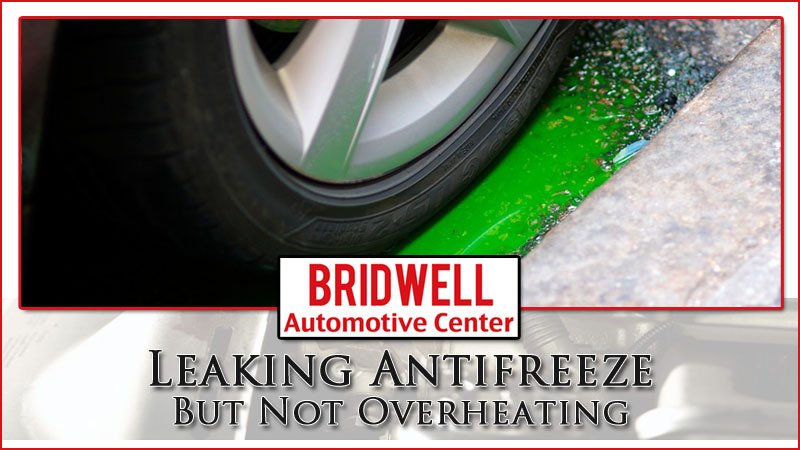 If you continue to drive your car with low antifreeze your vehicle will eventually overheat. An overheating engine can cause more problems especially if you let it go too long and end end up cracking your block. Chances are you have either a radiator cap leak, internal coolant leak or an external coolant leak. The longer you wait the higher the coolant leak repair cost will be. Learn how to diagnose your antifreeze leak and learn what to do next. Can You Drive Leaking Coolant? If you are experiencing coolant leaks in Scottsdale, Arizona, Bridwell Auto Repair can help. Our ASE certified mechanics have experience in repairing all types of coolant leaks. 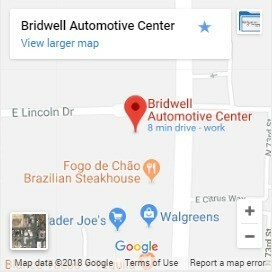 It’s quick and easy to schedule an appointment with Bridwell Automotive Center. Simply call and let us know what’s been going on with your vehicle, or if you need a tow to our shop for repairs. Remember driving while your engine is overheating or your coolant system is malfunctioning can lead to expensive repairs like engine replacement. It can be narrowed down to three common core reasons as to why the coolants leaks, with each of those reasons varying in other possibilities and also in the extent of the damage. If you have recently noticed an accumulation of coolant under your vehicle or that the reservoir tank is not as high up as it usually is, these could be signs that your system has a slow leak. Another sign of a leak would be if your vehicles engine suddenly overheats, sometimes there can even be a coolant smell if it is leaking. Finding out the type of leak your coolant system has is not that difficult, however, locating it can be more of a challenge. It would be wise for a person to take a look at the coolant reservoir tank every other time they put gasoline in their gas tank. If the radiator cap doesn’t no longer fits as it initially did or if it is weak and wore out it can cause loss of your systems coolant by way of the overflow tube, and it will happen every time you run the engine very long. The radiator was designed to be pressurized, so should the radiator cap fit incorrectly, improperly fitting, or maybe it is not the correct cap for your radiator, either way pressure will end up being lost and this let go very long could also create damage to a hose, causing even more repairs to be done. Having a pressure test performed on the radiator cap will help in diagnosing the problem. Solution: Simply replace your radiator cap with one the fits correctly. You can find out in the vehicles manual what the proper cap is and what your pressure should be. For starters, if it is an internal leak there will not be a pool of coolant under the vehicle, but rather, you will find yourself constantly having to put more water in the radiator as it quickly overheats and it either leaks out or evaporates. For internal coolant leaks you will need to look at the head (cylinder block), it could also be that you have a leaky head gasket, as this will let the coolant seep out. Solution: Bring your vehicle to an auto repair shop for diagnosis unless you know how to disassemble your engine. The easiest to pin point what the problem is would be if it is an external leak. Usually, if you have a leak that is external, the vehicles coolant is going to escape rapidly allowing the vehicle to overheat quickly. You should be able to determine where the leak is just by observing. It may be a broken hose and/or a hole in the radiator. Solution: Check your hoses to see if any coolant is coming out. Replace the hose(s) if you notice coolant coming out of them. If you notice coolant leaking out of your thermostat that can be an easy fix. It only costs about $10-$15 to replace a vehicles thermostat and is one of the easiest repairs you can do yourself. However, if the coolant is leaking from your water pump, that can get a little more expensive. Depending on your vehicle, you or an auto mechanic might need to buy a water pump replacement tool from the dealership to replace your water pump. If you’re struggling to find the source of your coolant leak there’s a chance it is caused by a blown head gasket. The head gasket seals the engine block and cylinder heads. If a head gasket fails it may cause a serious coolant leak and overheating or may be a small leak that is hard to detect. Worse yet the coolant may try to mix with your engine oil. If this happens you’ll likely lose all compression and make it so you cannot drive your car. Solution: The solution for a blown head gasket is to replace it immediately. It will require some disassembly of your engine so the cost for labor will typically exceed the cost of the part. However, these can also be easily diagnosed with a visual inspection. It could also turn out to be that the coolant reservoir has a crack. The coolant is part of the vehicles main system, it is what helps in keeping the vehicles engine cooled down and will more than likely not be what makes the vehicle overheat, this may however be the reason that after the vehicle has sit a very long time you see a pool of coolant under the vehicle. A vehicle cooling system is crucial to your vehicle functioning properly, and when there is a leak in the coolant of your car it is going to affect its efficiency, and in general, the way that it performs, and it will gradually begin overheating. The purpose of the vehicles coolant system is to keep the engine from overheating, and this is done by the cooling system circulating through the engine through pipes and a radiator. When the vehicle is running the coolant, temperatures will rise gradually letting the coolant expand and moving the excess into the reservoir through rubber hoses. Moreover, if the system begins working improperly it is important to have it fixed as soon as you, but if keep letting it go you could be facing some expensive repairs. Don’t worry too much though, coolant leaks are one of the most common engine problems and can be fixed. There are some clear signs you can watch for to be ready to catch coolant leaks early and prevent damage to your vehicle. These include when your heater won’t work, the temperature gauge is high or low, the coolant light is on, you smell something sweet, or you’ve lost some fuel economy. The heater in your car or truck is powered by the coolant that keeps your engine cool. When your heater will not work it’s a sign that there either isn’t enough coolant in your car or there’s a blockage of some kind. If you think the heater just isn’t putting out the heat like it should you should have your vehicle’s coolant and heating system inspected. When you’re vehicle’s temperature goes up or down from the normal level as you’re driving it can be a sign of coolant system problems. Problems can be something simple like low coolant level or something more serious such as a blocked radiator or a broken cooling fan. It’s important to get this type of problem checked out promptly to avoid damage to you vehicle. As strong as metal is the components in your motor can easily get too hot and melt, crack, seize, or completely fail causing you costly repairs. Most modern vehicles are equipped with warning lights for engine temperature. They usually look like a temperature gauge with wavy lines. It’s purpose is to let you know you should stop and check out why your engine is overheating. You may have a cracked or broken hose that’s allowed large amounts of coolant to spill out. Read about what to do if you’re car has overheated. Antifreeze smells sweet, so if you’re smelling something unusually sweet after you’ve had a temperature warning or you’ve got steam billowing out of your hood, it’s probably your coolant. This is a good time to start checking for obvious leaks under your vehicle. Avoid trying to remove the radiator cap until your vehicle is completely cooled down, this may take up to 45 min. Engines are designed to work under very specific operating conditions. They get their best performance and fuel mileage at specific temperatures. If it’s too cold it won’t use the fuel correctly and will not get the fuel economy you’re supposed to get. If you’ve noticed a deterioration in your fuel mileage bring your vehicle in to get checked out. No, you should never drive a vehicle that’s leaking a significant amount of coolant or has a broken radiator. If your vehicle’s cooling system is faulty it will overheat and cause serious damage to your engine. Overheating engines can lead to cylinder heads to warp, your engine to seize, cylinder head gasket failure, or your engine block to crack. These are all extremely expensive repairs and you should avoid driving your vehicle at all costs. Get it towed into a trusted automotive repair shop and have it repaired. How Much Does Coolant Leak Repair Cost? The cost of getting a coolant leak repaired varies by the type of vehicle and what’s causing it to leak. According to AutoServiceCosts.com an antifreeze leak repair cost should be between $90 and $115 dollars. Depending on what’s wrong with your antifreeze coolant system the costs may be less or higher. High performance or exotic vehicles will have higher coolant leak repair costs as replacement parts for these vehicles typically cost more. 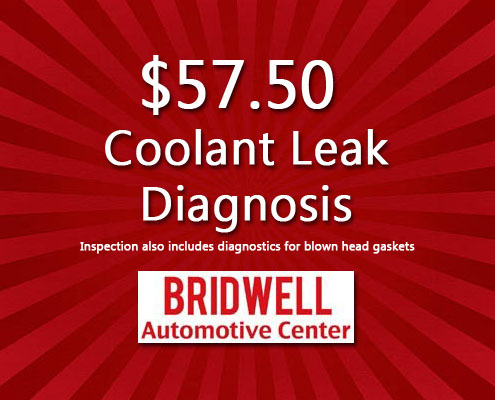 For more information about how much your coolant leak inspection will cost along with a quote for repair please give Bridwell Automotive Center a call to schedule an appointment at (480) 948-4781. My coolantpools on top of the engine block near top rad hose.I’m told it is a head gasket, but hoping its not. I’m cutting 2 inches off top hose. I have a 2002 Saturn l300. I’ve noticed a slight seeping leak around the thermostat housing unit. I’m worried it’s a head gasket. Does anyone have any idea what may be going on. It looks as if the gasket needs replaced around the housing. My truck has a mysterious leak. The coolant pools on top of a crevasse near the top hose in front of the 302 F8ord engine. Does not overheat. I’m told may be head gasket $400.00). I’m replacing top radiator hose. Also, in researching his issue I’m informed it could be water pump on other side of engine and a couple of other reasons. Where to go from here or what to watch 2012 cruise i smell something when heat is on car was pressure tested not running hot don’t see leak yet very confusing??? Hey. I have a 2012 Chevrolet Sonic LTZ. I have 140, 000 miles on it and have had no problems until now. About 2 months ago I started losing heat. Took it to a reputable mechanic ; had a pressure test and visual inspection done. After checking my radiator and resevoir it was found to be low in Antifreeze. They put Antifreeze in the Radiator and off I went with the heat restored., one month later same problem., same steps. the var… No white smoke… No smell….No leaks around the Radiator, however I had to put another half gallon of Antifreeze in the Radiator in less than a week. Need an answer.What should I do? Have yo keep putting antifreeze in my car til I get it to the shop Monday morning January 21st 2019. Have to drive 23 miles in the morning to work. When I get off work at 10am I will have it towed yo the car repair shop. Hope it’s just a hose. I have a 2013 Ford Taurus, I keep losing antifreeze but it’s not overheating can’t really see any leaks. When I turn the car on I could see bubbling in the reserve. 2007 Jeep Liberty, while parked but running coolant was leaking out at a high rate, drove it home, no overheating, water around right side of the water pump. Replaced water pump about 5 years ago. Since there is no overheating not sure where it’s coming from. HELP! !